I recently learned something about AR-15 bolt carriers that I never knew before. I thought that it was interesting stuff, so I thought that I would pass the info along. I got my first AR-15s back around 1994. The first was a 9mm which I eventually sold. The second was, and is, in caliber 7.62x39. Up until very recently, I never had one in .223. The easiest path for me to go .223 was to buy an upper to mount on my old Colt lower. After swapping uppers, I tried to close the two receivers and found out that I couldn’t. Something was blocking the upper from closing down on the lower. I ordered the new .223 upper from Palmetto State Armory for a very good price. But it was without a bolt and bolt carrier group, so I went off in search of a low cost bolt carrier assembly. I found one such assembly from suplusammo.com. What I bought is known as a “full-auto” bolt carrier. 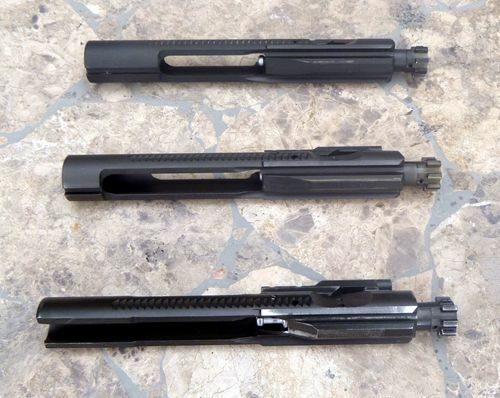 It is perfectly legal to own, and in fact, is the most commonly available style of bolt carrier on the market today. The rear 1.6” of the bolt is fully circular in shape. In contrast, the rear portion of my factory Colt bolt carrier is C-shaped. The bottom rear of the carrier is completely open. 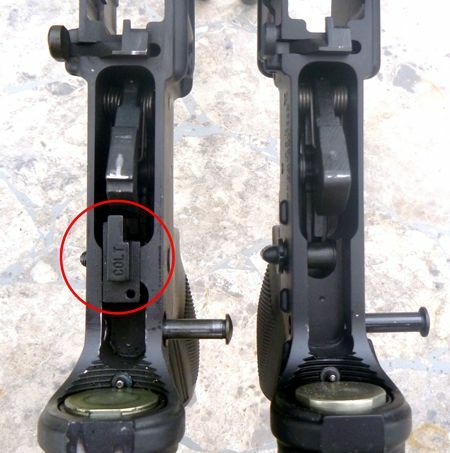 When I tried to close the receivers with the full-auto bolt carrier installed, the closed bottom-rear of the new carrier interfered with a Colt-marked “thing” that is permanently pinned into the Colt lower receiver. I learned that this thing is called a Colt sear block. Left, Colt lower receiver with sear block. As the earliest maker of AR-15s on the civilian market, Colt did a number of things to prevent assembly with military surplus M16 parts so that civilian Colts could not be easily converted to full auto. This sear block, and the cut-away bolt carrier were two such precautions. Apparently, the ATF has relaxed requirements for some anti-conversion features so that all civilian ARs that are built today do not have sear blocks and milspec (full-auto) bolt carriers are allowed. To be able to run my .223 upper, I had to swap bolts between the two carriers (different rim sizes between the 7.62x39 and the .223) and run the Colt carrier with my Colt lower. I put the full-auto carrier up on a shelf. Then I decided to buy another new AR, a budget Del-Ton Sport. This rifle came with another different type of bolt carrier. This one was equipped with a “semi-auto” bolt carrier. The rear circular portion of this bolt is only .740” long, and as it turns out, does NOT interfere with the Colt sear block. So I swapped this semi-auto carrier into the PSA upper on the Colt lower, and was able to return the Colt carrier and bolt to the 7.62x39 upper. The Del-Ton is perfectly happy with the full-auto bolt carrier.